Here is the weekly review of the top performing Central African players, who play currently abroad. #1. This week's number one is an international power forward Johndre Jefferson (207-88, agency: Inception Sports, college: S.Carolina, currently plays in Croatia). 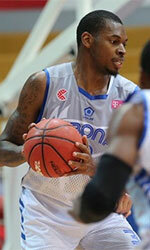 He could not help Cibona (7-2) in their last game. Despite Jefferson's very good performance the league leader Cibona was edged 70-67 on the road by the lower-ranked (#3) Split. He had a double-double by scoring 15 points and getting 10 rebounds. Jefferson also added and 3 steals in 29 minutes on the court. This year Jefferson averages: 9.2ppg, 5.2rpg, 1.3spg, 2FGP: 64.0%(32-50) and FT: 79.2% in nine games he played so far. He is a naturalized American. Jefferson is currently a member of the Central African senior national team. Strangely he has never played in Central Africa. #2. Second place goes to former international power forward James Mays (205-86, college: Clemson, currently plays in South Korea). 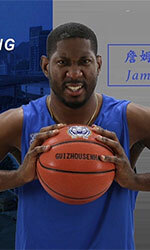 Mays was not able to help LG Sakers (11-9) in their last game on Friday. Despite his very good performance LG Sakers were defeated 100-92 in Anyang by the lower-ranked Anyang KGC (#5). Mays recorded a double-double by scoring 33 points and getting 11 rebounds. He also added 3 assists and 3 steals. It's Mays' first season with the team. Mays has individually a very good year with high stats. He averages: 28.9ppg, 14.1rpg, 2.0apg, 1.5spg, 2FGP: 59.6%(204-342), 3FGP: 28.2% and FT: 55.1%. Mays is a naturalized American. He played for the Central African national team in 2013. Apparently Mays has never played in Central Africa. #3. The Central African player who performed third best last week abroad was an international small forward Max Kouguere (198-87, currently plays in France). He was not able to secure a victory for Olympique Antibes (2-10) in their game against JSF Nanterre (5-8) in the French ProA. Kouguere scored 5 points in 21 minutes. Olympique Antibes lost 73-78 in Nanterre to the higher-ranked (#14) JSF Nanterre. It was Olympique Antibes' sixth consecutive loss in a row. This year Kouguere's overall stats are: 5.8ppg, 2.2rpg, 2FGP: 28.6%, 3FGP: 38.6% and FT: 54.5% in 12 games. He has a dual citizenship: Congolese and Central African. Kouguere is also a member of the Central African senior national team. #4. Power forward Jimmy Djimrabaye (202-92, currently plays in France) contributed to an easy victory against the closely-ranked C'Chartres (3-5) 94-78 in the French ProB (second division) in Saturday night's game. He scored 9 points. Quimper UJAP (3-5) is placed 13th in the ProB. But this is still an early stage of the season and everything may happen. Djimrabaye's total stats this year are: 6.3ppg and 3.0rpg. He is also Central African national team player.